(Nanowerk News) A UK, Canadian and Italian study has provided what researchers believe is the first observational evidence that our universe could be a vast and complex hologram. 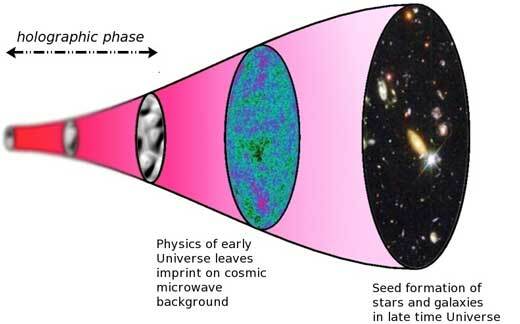 Theoretical physicists and astrophysicists, investigating irregularities in the cosmic microwave background (the 'afterglow' of the Big Bang), have found there is substantial evidence supporting a holographic explanation of the universe - in fact, as much as there is for the traditional explanation of these irregularities using the theory of cosmic inflation. The researchers, from the University of Southampton (UK), University of Waterloo (Canada), Perimeter Institute (Canada), INFN, Lecce (Italy) and the University of Salento (Italy), have published findings in the journal Physical Review Letters ("From Planck data to Planck era: Observational tests of Holographic Cosmology"). A holographic universe, an idea first suggested in the 1990s, is one where all the information, which makes up our 3D 'reality' (plus time) is contained in a 2D surface on its boundaries. Professor Kostas Skenderis of Mathematical Sciences at the University of Southampton explains: "Imagine that everything you see, feel and hear in three dimensions (and your perception of time) in fact emanates from a flat two-dimensional field. The idea is similar to that of ordinary holograms where a three-dimensional image is encoded in a two-dimensional surface, such as in the hologram on a credit card. However, this time, the entire universe is encoded!" Although not an example with holographic properties, it could be thought of as rather like watching a 3D film in a cinema. We see the pictures as having height, width and crucially, depth - when in fact it all originates from a flat 2D screen. The difference, in our 3D universe, is that we can touch objects and the 'projection' is 'real' from our perspective.